Emerald has 5 preset behaviors each with 3 temperaments to give you control over how your AI dynamically reacts to targets. 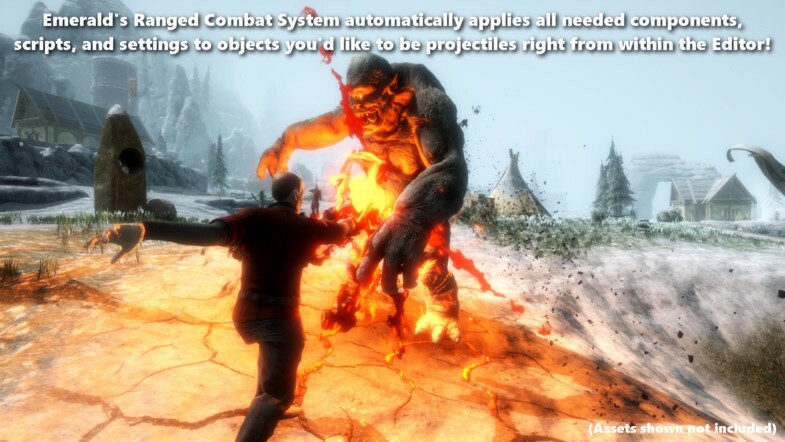 Companion and Pet behaviors are also possible allowing AI to follow players around to assist them in combat. The Line of Sight feature allows AI to only attack or flee from targets that are visible from the AI's line of sight. This also keeps AI from being able to detect targets through walls or objects. However, an option is also available to not use the line of sight feature, for those who want more of a casual RPG target detection. 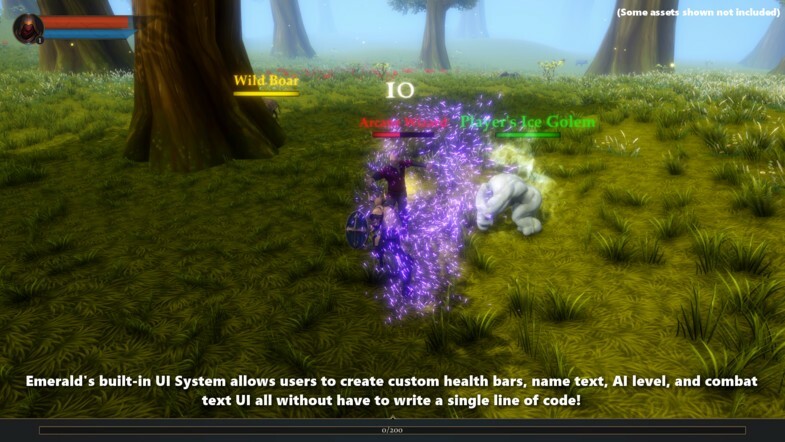 A built-in UI system allows AI to have health bars, display an AI's name and level, and combat text. The settings allow users to customize the color, images, size, and position. The UI system will automatically apply your settings and rotate towards your player's camera as needed. Emerald features a built-in ranged combat system that allows AI the ability to engage in ranged combat. 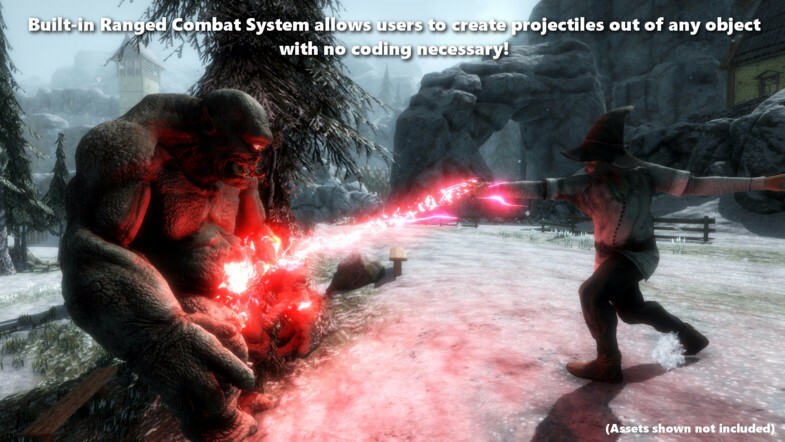 Each projectile's sound, speed, timing, effect, animation, and damage amount can all be customized. Emerald will automatically apply all needed scripts, components, and settings to the projectile object. Emerald features a built-in Waypoint System that allows users to set a series of waypoints for an AI to follow/patrol. AI will still react to targets using their behaviors while following their waypoint paths and continue to follow them after their target has been killed or escaped. Waypoints can be set, added, manipulated, and cleared all from within the Emerald AI Editor using custom handles and icons. Well documented code with tons of API for advanced users. Emerald includes 17 examples scenes each demonstrating a different feature or capability. Scripting Reference site that shows and explains all of Emerald's usable API. Emerald's documentation covers every feature that you may want to use. The documentation is accessible right from within the Emerald Editor. 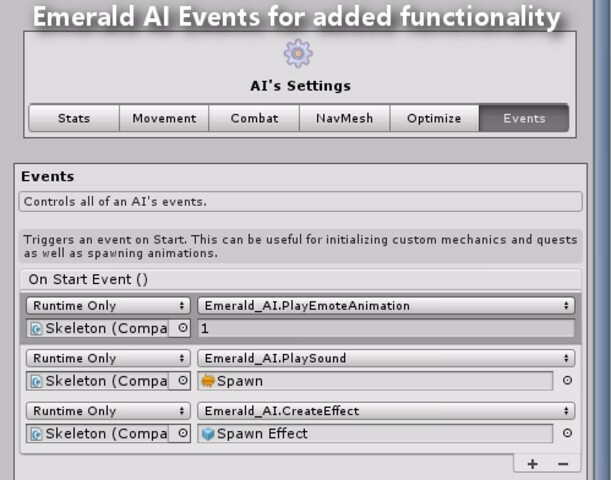 Emerald supports tons of animations an AI can use, allows users to change an AI's animations right from within the editor, and will automatically create and update an AI's Animator Controller. Each animation has its own animation speed control. The attack animation settings allow your AI's attack animations to perfectly match when damage is sent. - Fully compatible with VR devices such as Oculus Rift and HTC Vive.